At the University, we have a variety of sustainable transport options available for our staff and students. Ranging from car share schemes to cheaper bus and train tickets, there are a number of options available which you can find out more information about here. Visit our dedicated page on cycling to find out about CycLin at the University and Hirebikes in Lincoln. 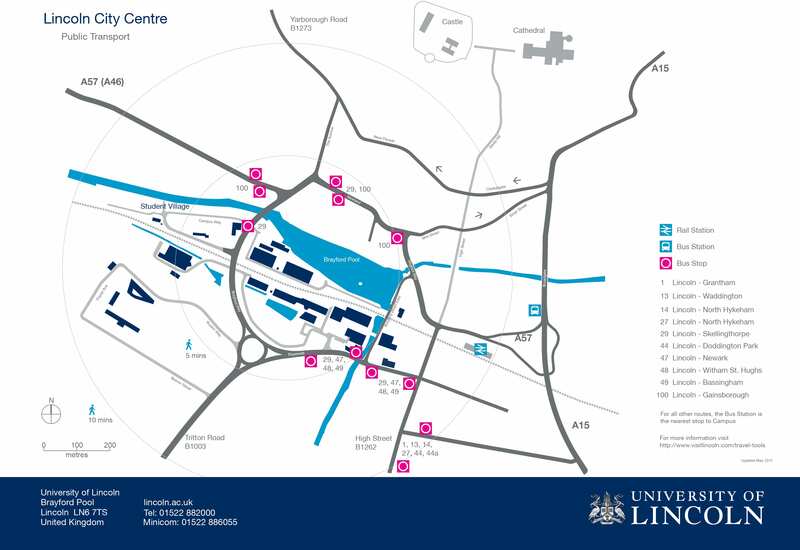 Here is a public transport map which highlights the nearest bus stops to the campus and the routes that stop in each bus stop. The train station and the bus station have also been highlighted to show the proximity to the campus. The Lincoln Business Improvement Group have created an website which allows individuals to register and find people that they could car share with. The Lincoln Business Improvement Group have also introduced the BIG bus deal which subsidies the cost of bus travel in Lincoln by up to £10 a month. 1. For most city commutes, a bicyle is quickest door to door. 2. Walking and cycling helps you to be punctual because you’re not affected by traffic levels. 3. Walks burns as many calories as jogging over the same distance. 4. Active travel is good for your heart and lungs, is great for strengthening your muscles, bones and joints and helps to control weight. 5. By walking and cycling regularly, you can greatly reduce your risk of stroke. 6. Cycling is inexpensive and walking costs nothing at all! 7. Walking and cycling does not produce any additional pollution – the only fuel you’ll need is food! 8. Active travel helps improve your mood and boosts your brain power. 9. It is even more enjoyable to walk or cycle with a friend. 10. Cycling allows you to carry your shopping, books etc. All you need are some panniers or a basket.